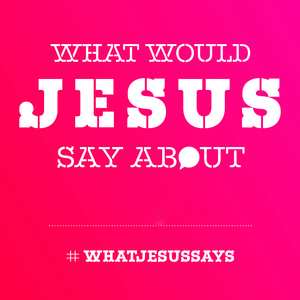 What Would Jesus Say About __________ ? What would Jesus say about The Church? This isn’t a hypothetical question, because the author of Hebrews says, “Jesus Christ is the same yesterday, today and forever”. His thoughts on the church today can be understood from what he said 2000 years ago. What would Jesus say about right & wrong? Jesus was often involved in arguments with people about what, and who, was right and wrong. When we see that He has authority to define right and wrong, and what He did with this authority, we should give up defining truth ourselves and happily obey Him. What would Jesus say about Himself? Jesus made claims about himself that are backed up by his actions in life and that demand a response from us. What would Jesus say about self-righteousness? Whether it's 2,000 years ago, as recorded in the Gospel of Luke, 500 years ago in the days of Martin Luther, or today, what Jesus says about self-righteousness does not change. Nothing you can do will ever make you acceptable to God except receiving his free gift of righteousness. Abandon your self-improvement programme and receive this free gift! What would Jesus say about communion? Communion is a meal of faith, not a dead religious ritual. It is a sign of the fullness of God’s grace towards us, of the height and length and depth of his love for us. What would Jesus say about the Old Testament? Jesus says that the Old Testament is relevant for our lives because its purpose is to lead us to find life in Him. What would Jesus say about prayer? Jesus calls us to pray and in return we get to drink from rivers of living water. Prayer reminds us of grace, hope and power, which we need every day. What would Jesus say about baptism? Baptism might seem like a strange thing to do in our culture. But it represents the death of our old sinful selves and our new birth into a life reconciled to God and empowered by the Holy Spirit. What would Jesus say about social media? As followers of Jesus, Social media gives us a great opportunity to bring truth and light into a dark world. God wants to bless your time on social media. He wants it to be fruitful and joyful. What would Jesus say about the Holy Spirit? Jesus promises the Holy Spirit as a gift to all his followers. This gift cannot be earned by merit but can be received by faith. When we receive the Spirit he helps us to know God, to experience his love, and to receive his gifts. We need him everyday! What would Jesus say about work? The bible tells us that we are made for work and that God has given us work to do. Genesis 1:26: “Let us make man in our image, after our likeness.” God, the Creator, the Author, the Gardener, formed us and gives us dominion over the earth. He makes us in His image: creators, authors and gardeners with roles to play as part of his Kingdom, for His glory. What would Jesus say about Christmas presents? What would Jesus say about Christmas presents? He would celebrate generosity and urge you to be counter-cultural. He would also point you towards Him and the miracle of the incarnation, one of the greatest acts of love in history.